Hello, everyone! In my previous article, I discussed the cheetah nutrition project I helped conduct at the AfriCat Foundation this past summer. 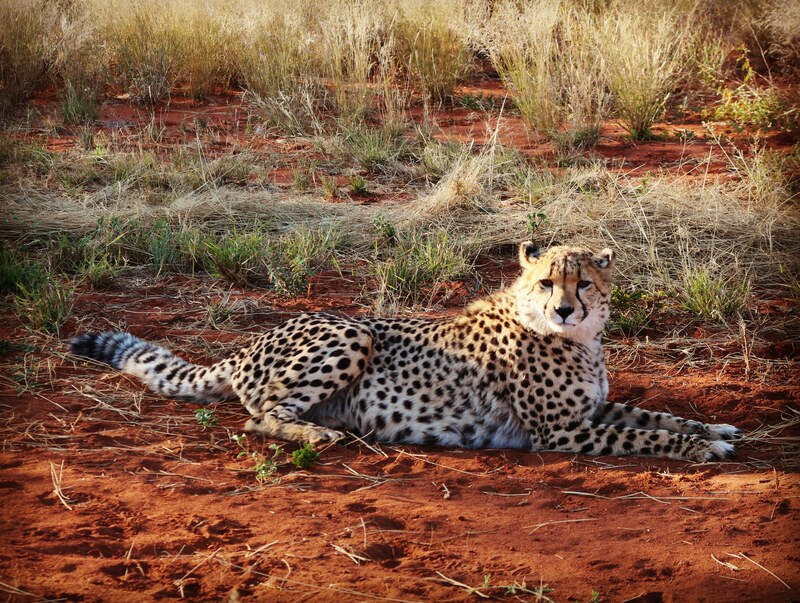 Obtaining a first-hand view of Namibia through this unique veterinary lens allowed me to delve into a new facet of my career path while assisting AfriCat in their efforts to champion cheetah conservation. In fact, I reflect fondly on my time in the African bush because it dovetailed clinical work and educational outreach along with my primary purpose of intensive field research. After spending eight weeks in Namibia, where I was able to intimately experience the vibrant fauna and flora of the Okonjima Nature Reserve, indeed what I loved most was that no two days were ever the same. Whether it was tracking a pangolin all the way up a thorny, wobbly-rocked mountainside, climbing atop a holding truck to perform surgery on a kudu with traumatic oral injury, darting and collaring a lioness to obtain GPS data, conducting an ophthalmic exam on a leopard with an advanced cataract, watching the sun set over a placid dam with elementary school students, roasting marshmallows over a campfire while discussing the evolutionary adaptations of our favorite animals we spotted on a safari drive, naming and tasting the edible plant species that are native to Namibia, or lying underneath the African night sky to identify constellations as our bodies rested gently in the sand … each day presented its own exciting itinerary, in which I gained clinical knowledge of wildlife species in the field and participated in AfriCat’s outreach initiatives by working with local schoolchildren. 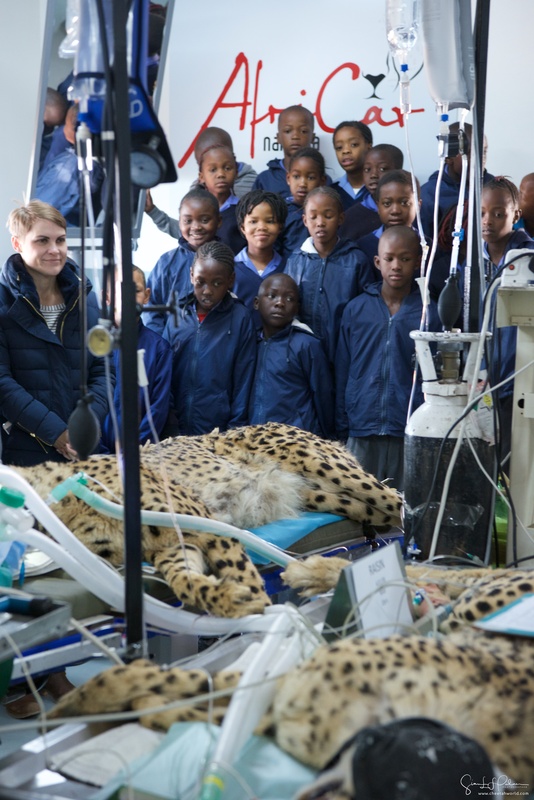 While veterinary care is essential in maintaining the health of cheetahs, education of the global community is necessary to promote and mobilize conservation efforts. It was truly an honor to collaborate with esteemed professionals to learn how to better manage cheetahs in captive or semi-free ranging conditions and ultimately protect their population at large. Although I definitely improved my clinical competency with wildlife medicine, this opportunity also enabled me to better understand the institutional factors and management strategies that conservation hinges upon. Furthermore, it was rewarding to extend that knowledge by providing interactive lessons and activities to teach the young generation about carnivore conservation and the agro-ecosystem. AfriCat’s teaching philosophy is based upon the following quote from Baba Dioum: “In the end, we will only conserve what we love, we will only love what we understand, and we will only understand what we are taught.” The program itself aims to increase the students’ awareness of environmental issues, develop a sense of agency regarding their roles and the sustainable living practices they can engage in, and empower them to harness their strengths and passions to become ambassadors for wildlife. 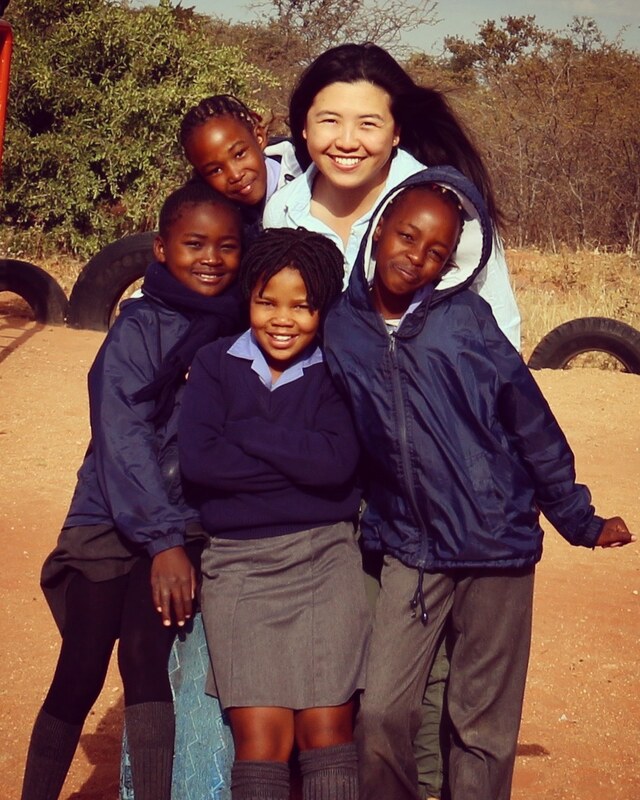 Through such education and awareness in the Namibian youth, we hope to build a future generation of conservationists that can one day competently manage the carnivore populations in Namibia, devise practical solutions to human-wildlife conflict, and balance the needs of endangered species with the economic livelihood of farming communities. Although tourism generates an appreciable amount of revenue to fund conservation projects, big cat populations are still threatened by shootings due to farmland encroachment, a response that mainly stems from a lack of education about how both parties can coexist peacefully. By inspiring young students, several of whose families actually own farms, to see the value of wildlife and ignite their passions for conservation, we are addressing the imperative that saving these carnivore species undoubtedly requires investing in the youth of Africa.